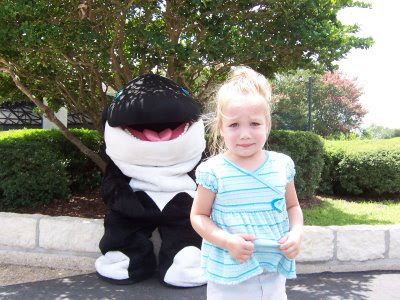 Apprehensive girl decides it is safe enough to get picture taken with Shamu... as long as mommy is doing it too. 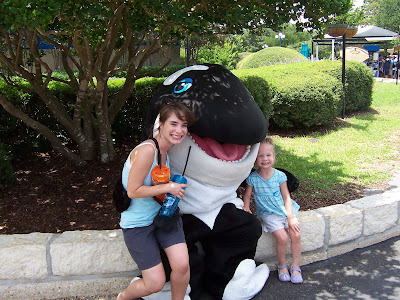 Girl loses all feelings of self-assurance halfway to Shamu and returns to mother. Mother explains that this is the last chance for any interaction with Shamu. 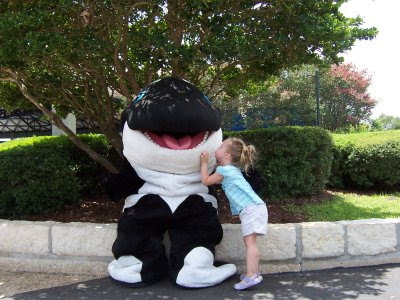 After a moment of deep contemplation girl returns to Shamu plops a quick peck on his cheek and quite nearly floats away from renewed confidence and a heart full of love for Shamu. Girl then spends the next 4 days talking incessantly about her brush with fame. Mother is overjoyed with girls excitement and new found self-confidence! To girl - WAY TO GO! To mom - NANAI NANI BOO BOO! Oh my gosh this is the cutest post ever. So cute! I love love love it! That is SO cute! You shouldn't knock her fear of the Shamu - I had an all-encompasing fear of anything pretending to be Mickey/Pluto/Ronald Macdonald that was clearly a teenager in a suit until I was, oooo, 35.